Hunters who dream about the hunt of a lifetime are reminded that application deadlines are quickly approaching! 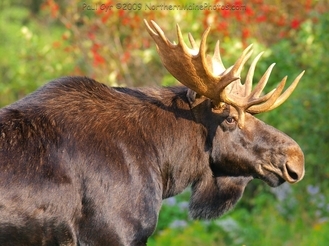 Paper applications for the 2016 Maine moose permit lottery must be postmarked by April 1, 2016, or delivered to 284 State Street in Augusta by 5:00 PM on April 1, 2016. Paper applications are available by contacting the Department at (207) 287-8000 or from our website at www.mefishwildlife.com. The deadline to apply online is 11:59pm on May 16, 2016. The online application process is fast and simple and provides instant confirmation. To apply online, please visit https://www5.informe.org/online/moose/. Applicants are awarded bonus points for each consecutive year that they have applied for the lottery since 1998 without being selected and each bonus point gives the applicant an additional chance in the drawing. Bonus points are earned at the rate of one per year for years one to five, two per year for years six to 10, three per year for years 11 to 15 and 10 per year for years 16 and beyond. Since 2011, applicants can skip a year and not lose their bonus points. So if they applied in 2014 but not in 2015, they still have their points available if they apply in 2016. The moose permit drawing will take place on June 11, 2016 at Kittery Trading Post in Kittery, Maine.